Africa’s leading hotel booking website, Jovago.com has signed a partnership with Tanzania’s Precision Air PLC, one of the region’s leading carrier. 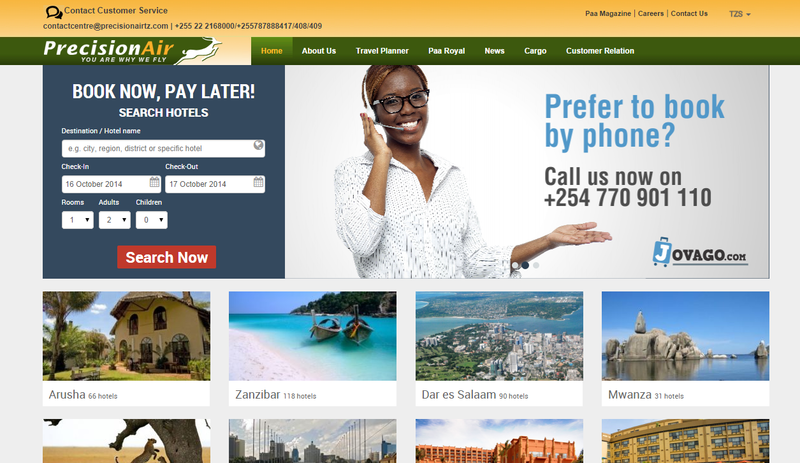 Jovago’s new Partnership with Precision Air-one of East Africa’s largest regional air service- enables customers to access online hotel booking options on the Airline’s website. Commenting on the same, AzdaNkullo – Head of Corporate Communication for Precision Air noted that, “Airlines and hotel industry have always been interdependent hence our new partnership only solidifies the existing bond with a main focus on the customer”. The partnership between the two parties offersthe customer a variety ofup to 10,000 African hotels and about 200, 000 hotels worldwide. “We believe thisvalue added service to the customer will go a long way in promoting inter-region tourism in East Africa, especially after three of our countries appeared on WTO recent report on Africa’s most visited destinations” Concluded Verdier.